Hello lovelies! It's the last Monday Blues of the year! 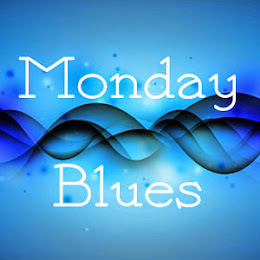 If I'm not mistaken, I have done 35 Monday Blues posts this year. That's almost 8 months worth of posts, and I'm so proud that I didn't miss one week since I started this. So naturally, I had to close the year with a really special polish. This is one that has been talked about and raved about so much, that I don't think it needs any introduction. I think the people who know me well or read my blog constantly are sick of hearing me talk about this polish. It has been on my wishlist since this spring, I think, but when I saw it in London I was incapable of spending 11£ on a polish. So I waited patiently for Asos to bring out some kind of set or offer. My patience was rewarded and I got this and 3 other Nails Inc blue polishes for only 20£. Just in time to wear it for my birthday. 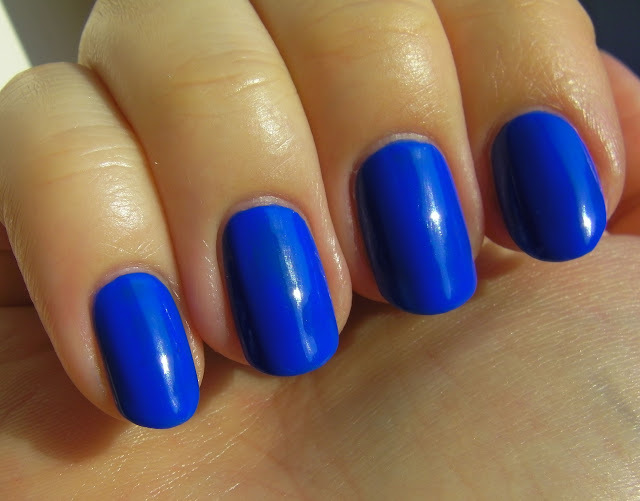 Baker Street is the most gorgeous cobalt blue creme ever invented. But of course it's a pain to photograph. It's a bit more purple in real life compared to my artificial light pictures. In the sun, it looks less purple but a bit darker than my pictures show. Oh well, at least you can have an idea of the color from my photos, but you will have to see it in person to understand its true beauty. I have a couple of similar polishes (Astor 070 and H&M Blue My Mind) and I will try to do a comparison and show the differences between them. One thing that makes this a winner is the great formula. 2 coats are enough to make it opaque and it dries very shiny. I noticed that it has a weird smell, similar to latex, but those who work with latex gloves like me shouldn't mind too much. To others it could be a little disturbing. Hello lovelies! Two days left of 2012 and it's time for a little roundup. I did this on Instagram and decided to do it on the blog too. 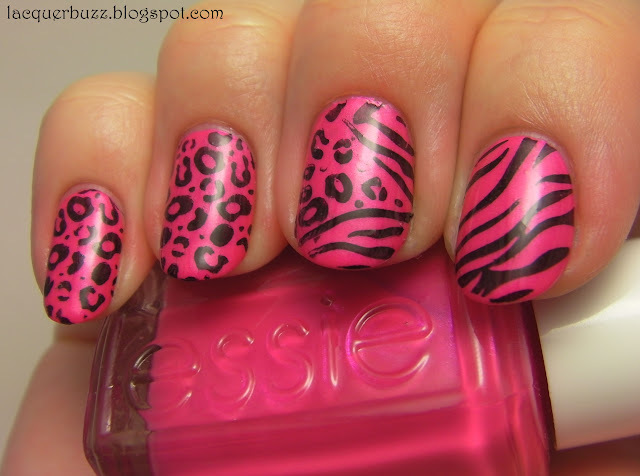 For this post I chose my favorite nail art type manicures from this year. There will be a separate post for my favorite polishes of 2012 in the following days. The manis are in chronological order because I really couldn't rank them. You can click on the pictures to see the different posts. Enjoy! Makeup Demon: Makeup idea for Christmas, New Year or other party. Let's sparkle! Confessions of a Sarcastic Mom: The Zoya Lovely collection is full of fun, airy pastels! See Destany's swatches. Lola's Secret Beauty Blog: Looking for a fabulous new eye cream? Lola's Secret Beauty Blog loves vbeauté Eye Never Nourishing Eye Crème because it does EVERYTHING a great eye cream should do! Rachel's Makeup and Skincare: Rachel once again indulges in her new obsession with Lush. 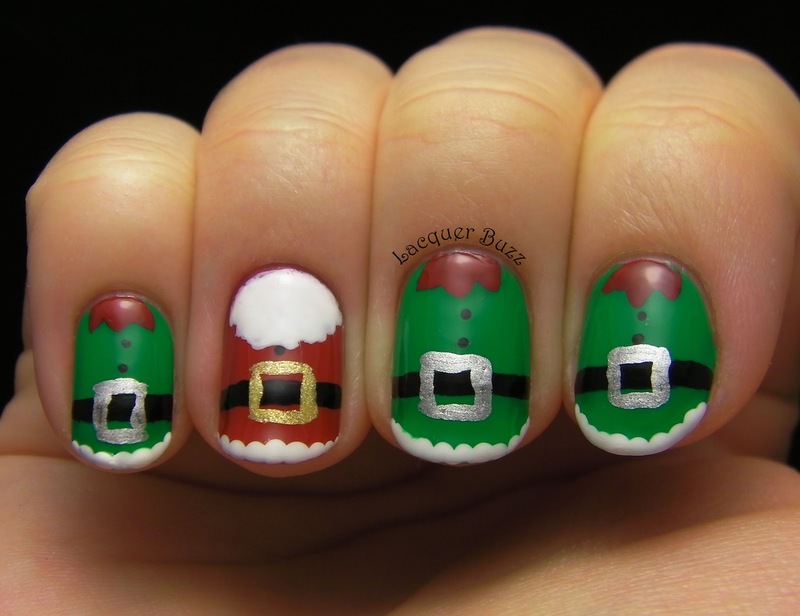 Lacquer Buzz: Christmas might be over, but it's not too late to take a look at this cute Santa and Elves mani! Beauty Info Zone: There's so much to love from Lush, everything is so cute including the names. Check out Mr. Punch soap to see why you need it. Vicerimus: Just spotted a lizard! 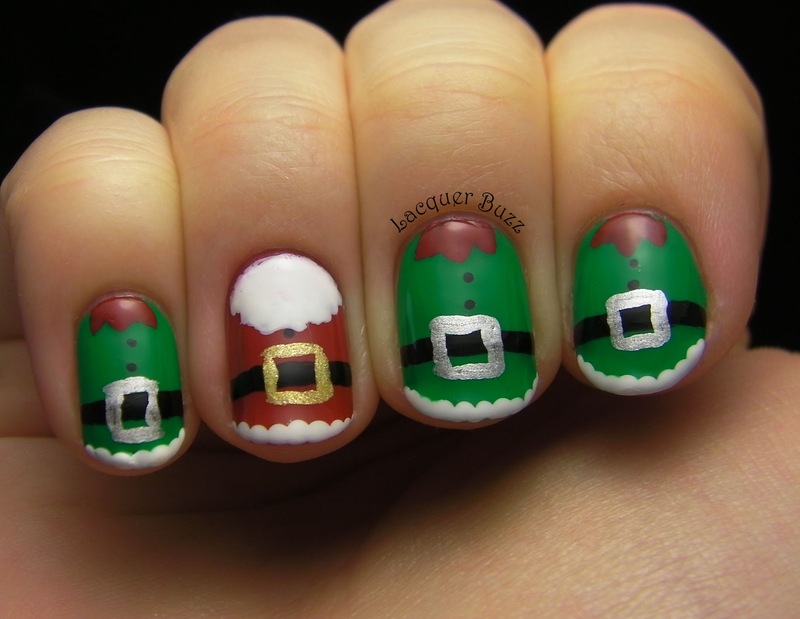 If you are a bit tired of blogs busy with Christmas nails (which are all awesome!) and want something else for a change, take a look at this reptile-inspired manicure (it's not an OPI Just Spotted A Lizard swatch post, though :P). Liesl Loves Pretty Things: West End Wonderland Part 2! Last week Liesl showed off the lippy. This week it's Butter London's gorgeous polish. Lisa's Nail Obsession: Pink gold on my fingernails? When I'm dressing up why not? Mama Fashionista: It's time for MAC Matters! See what Quinn picked as the 2nd item from MAC to build her "core collection!" Betzy's Makeup: My go to makeup look for running errands on weekends. Baking Beauty: Baking Beauty Rounds Up The Best New Year's Eve Manicures. Hello lovelies! How are you doing today? 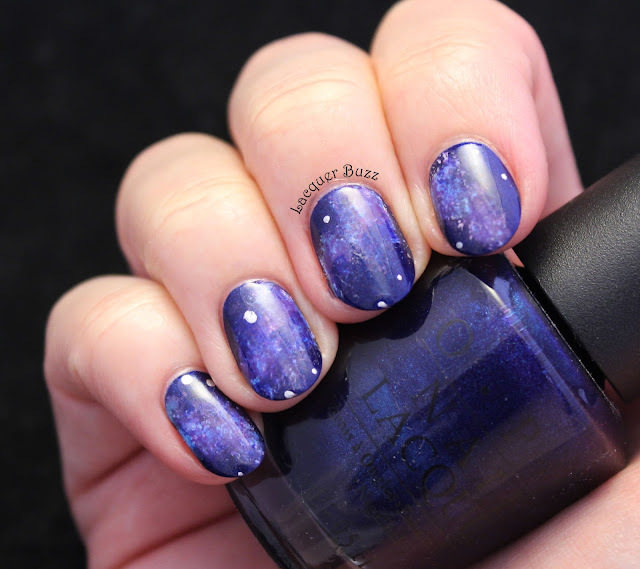 The end of the year is so near to us and I have a couple of 2012 favorites posts planned for you, but today I want to show you a polish from Essence that I haven't had the chance to post about, even though I wore it more than a month ago. I tell you, that swatch folder is so full of stuff, and I don't really know when I will post all of that. Oh My Glitter! is one of the new Colour&Go polishes that came out this year, and I also think it's one of the popular ones. I totally understand that, because it's really beautiful. However, I don't understand the name. I really hope that the Essence people don't think that this is glitter, because there's absolutely no glitter in this polish. What we have here is a light purple with pink iridescent shimmer. It looks more blue toned in my photos than it is in reality. 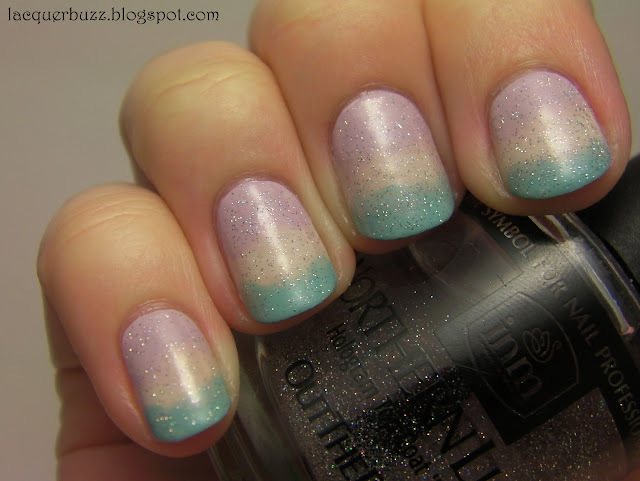 The consistency is on the thinner side, and I did 2 coats to achieve this look. The 2nd coat was a little thicker though, to make it opaque. The new brush however, is a real pain. It's monstrously huge and thick like a mop. If it wasn't for the great formula of this polish, application would be a nightmare. Another good thing about this polish is that it dries to a high shine. I also stamped a cute Hello Kitty image on the ring finger using plate FUN1 and China Glaze Liquid Leather. Excuse the shrinkage that my Seche Vite produced. This polish is great, especially for warmer seasons, and I can't wait to wear it next spring. There are a lot of good colors in the new Colour&Go line. I just wish they didn't have that awful huge brush. Hello my lovelies! How fast does the time fly! I feel like just yesterday I was starting this challenge and now Christmas is over and we're so close to the end of the year. This is the final installment of the Winter Holiday Challenge. I'm so happy I finished this one and did every single one of the themes. And to think that I was almost going to give up before it even started! There were some bumps on the road, but in the end I managed to post each of the manicures in time. Yay! So today's theme is: New Year's Eve. Since this is a holiday where people usually dress up nicely and go to fancy parties, I had to include glitter in my design. Gold seemed also appropriate for the occasion. 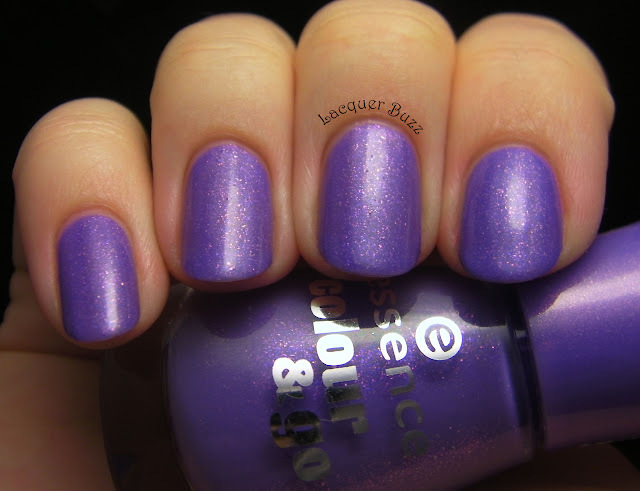 Most of the polishes I used come from Essence, except for the one I stamped with. The base is Essence Ticket To The Show from the Colour3 line. It was a Christmas gift from my sister, so I had to use it immediately. Here's a photo of Ticket To The Show by itself. Unfortunately, it did not photograph as pretty as it is in real life. The dark brown base is filled with tiny pink, green and gold shimmer. This shimmer doesn't stand out in the photo, but I assure you it looks better in real life. This was opaque in 2 easy coats and it dried to a nice shiny finish. The photo shows it without any top coat. I layered the other half of the Colour3 duo on the ring finger and thumb. It's called Front Row or Backstage? and is a very dense gold shimmer in a sheer brown base. You can't see it very well on the ring finger because I stamped over it with an image from plate CH9 from Cheeky and my trusty Golden Rose Nail Art 108 striper. The other nails have a glitter gradient which I did with Essence Make It Golden. I didn't use any sponges and just brushed the glitter on there, focusing more on the tip. Above you can see a better shot of the thumb, with Front Row or Backstage? peeking through. This is actually pretty opaque and does not show the base color, like other Colour3 layering ends do. Over it, I stamped an image from plate FUN2 with the same gold striper. Please forgive the awkward hand poses, but as I've told you before, my thumb is not very flexible and it's very hard to show it properly in pictures. Once again, I thank you for reading and looking at my pictures. Thank you for being by my side through this challenge. I really hope that you will visit me again to see my other challenges (Monday Blues, Where In The World or Polyvore Collage Day), as well as other swatches or nail art posts I will do in the future. Finally, don't forget to check out some amazing blogs below! Hello lovelies! I hope you had a wonderful Christmas with your loved ones! 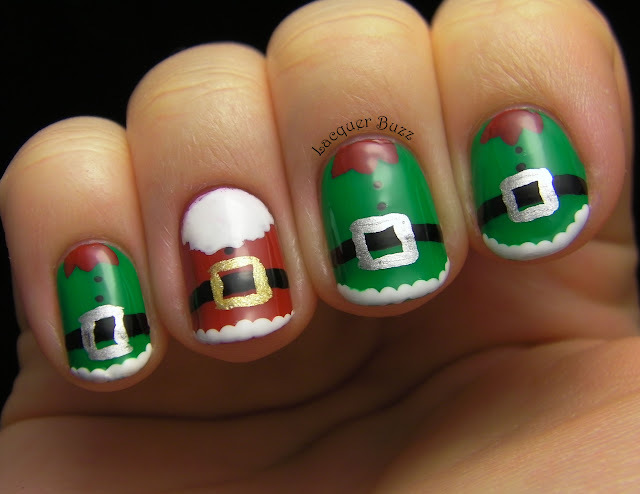 Even though Christmas was yesterday, the 26th is still a public holiday here in Romania, so I thought I would show you my festive manicure that I wore yesterday and on Christmas Eve. I usually like to go for glitter on special occasions because I think it's both festive and elegant enough to go with a special outfit. I didn't do anything out of the ordinary this Christmas, but I still kept the tradition of a sparkly manicure. So this is what I came up with. 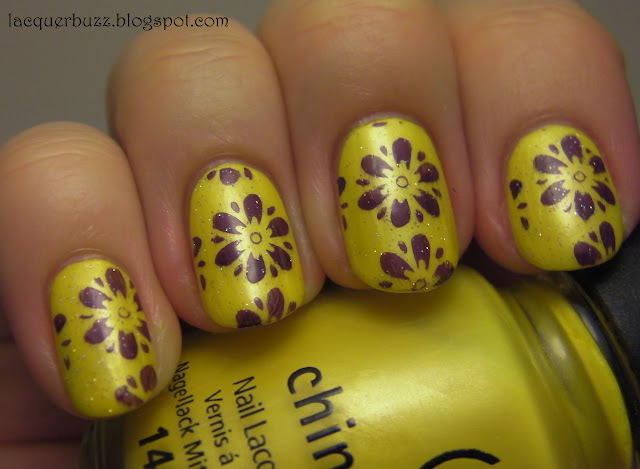 I was longing to wear my beloved China Glaze Glittering Garland again because it's truly stunning. Honestly, I was almost sorry to cover it with the glitter because it's so beautiful on its own, but in the end I went for the extra sparkly option and added one coat of Models Own Disco Inferno from the Mirrorball collection. I wasn't too crazy about this combo at first, because it seemed a little too crowded and over the top. But then I fell in love with it. Disco Inferno sure has a lot going on. 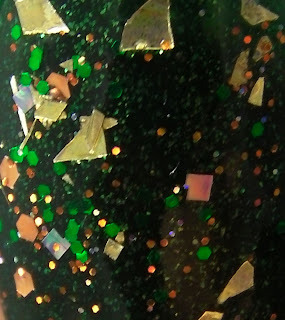 There are 3 sizes of copper glitter (tiny, medium and larger hexes) and medium green hex pieces. But the most important part is the presence of large gold shards, with different shapes and sizes. There were also some square and diamond shaped glitters in there, which I loved. All this, mixed with the beautiful light green flecks in Glittering Garland, was just spectacular. Here's a macro shot for you! The suspension base of Disco Inferno was kinda thick, which made it a little tricky to apply. You can see that there are different amounts of glitter on each of my nails. I still think that the glitter payoff is great for just one coat. You have to remember that these dry matte, so top coat is a must. Some of the glitter pieces may sit a little randomly on the nail, so two coats of top coat are necessary to make it all smooth. I really loved this manicure and I'm so happy I purchased this collection. I only tried two of these so far (the other one can be seen here) and they are amazing. This is the first time I buy an entire collection and I'm so glad I did! If you have access to these, do yourself a favor and get them! You won't regret it! Hello again lovelies! 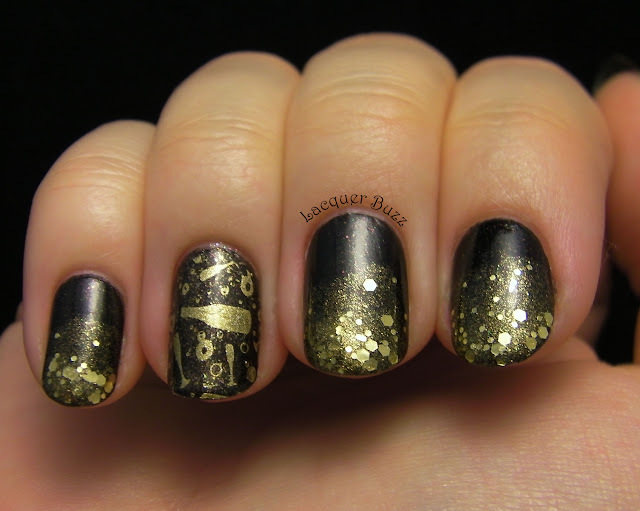 Here's my second post for the day, namely today's nail art challenge. Since tomorrow is Christmas and I don't have any posts planned for the day, I would like to wish you all a Merry Christmas! I hope these holidays will be spent with your family and loved ones, and the best gift you will receive will be health and peace. Seriously, I love receiving presents, but the things I mentioned are very important, and you don't realize that until you lose them. But enough with the sentimental stuff! Let's get to something cheerful. 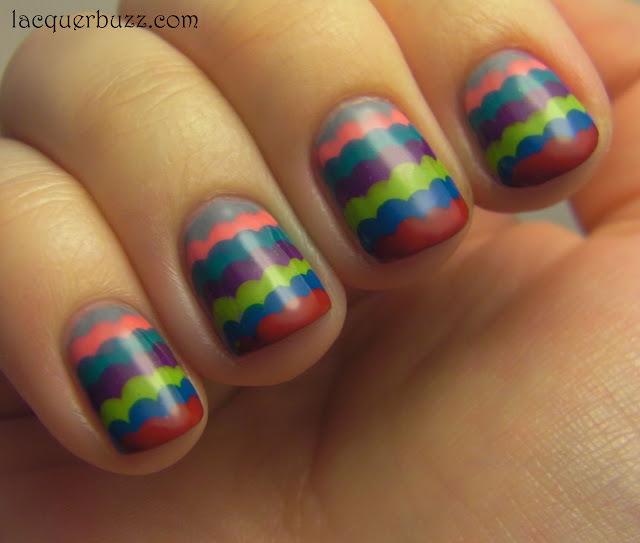 Today's manicure is all about fun. Aren't these cute? I did them on Friday and I'm still wearing them, which is a record for me. They are starting to chip, but don't tell anyone. 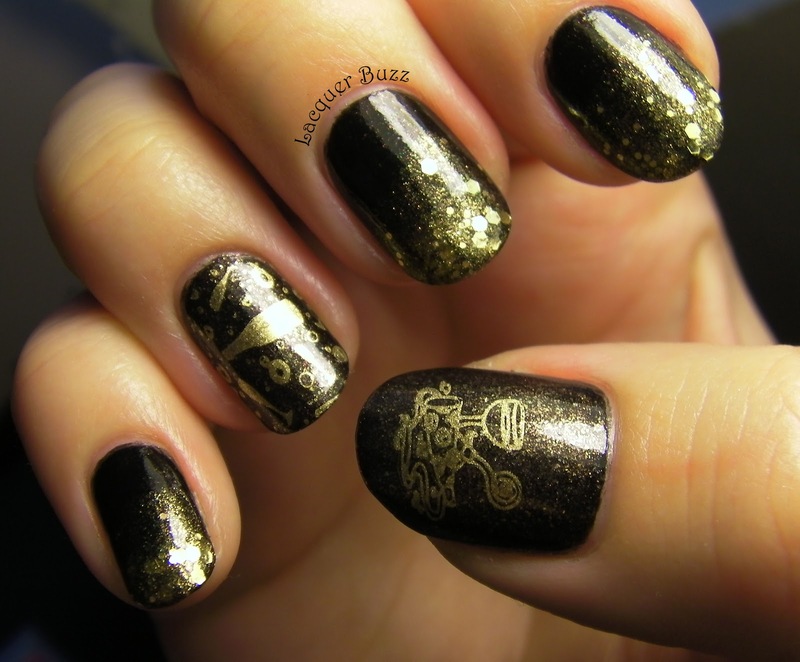 This nail art is not very original, but I really really like it. Now let's see what I used to make these. The green is Barry M Spring Green, and the red is Rimmel Stand to Attention. 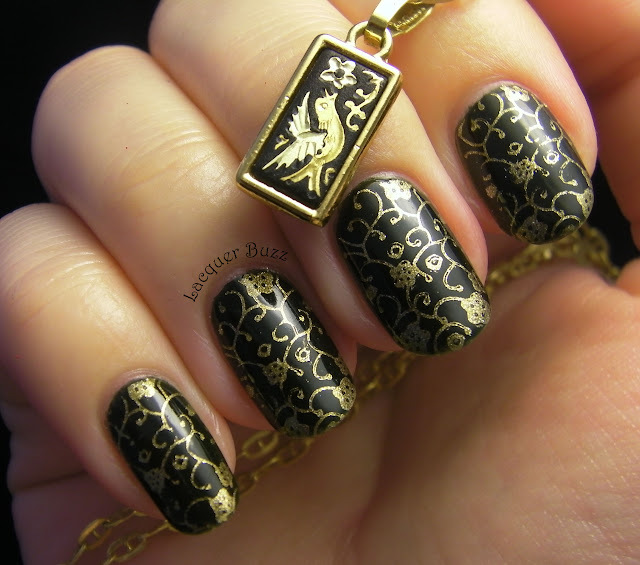 I also used white (Moyra 03) and black (China Glaze Liquid Leather). 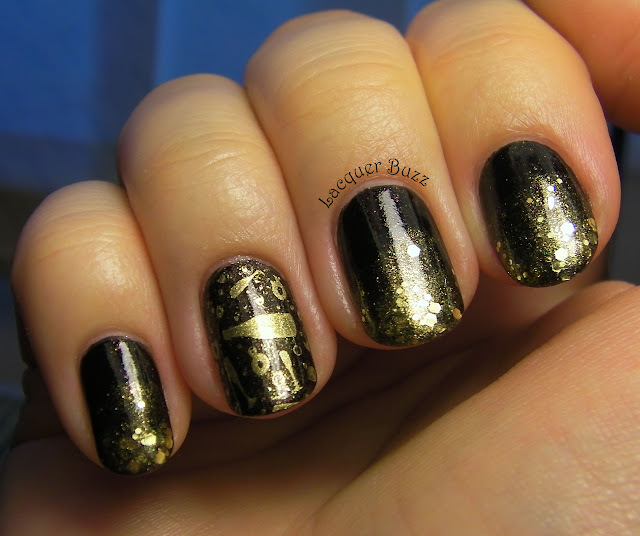 The belt buckles are a-england Excalibur (silver) and Golden Rose Nail Art 108 (gold). As tools I used a thin nail art brush, a striping brush and some dotting tools. A thick coat of Seche Vite and that's it. Thank you for stopping by and looking at my Santa and elf suits. Hope you have a very Merry Christmas! Here are the other ladies participating in the challenge. Hello lovelies! Here we are, Christmas Eve! I think this is the first Monday Blues that is actually a good one because everyone is on vacation. Or at least I hope so. It's a busy day since I have 2 posts for you today. 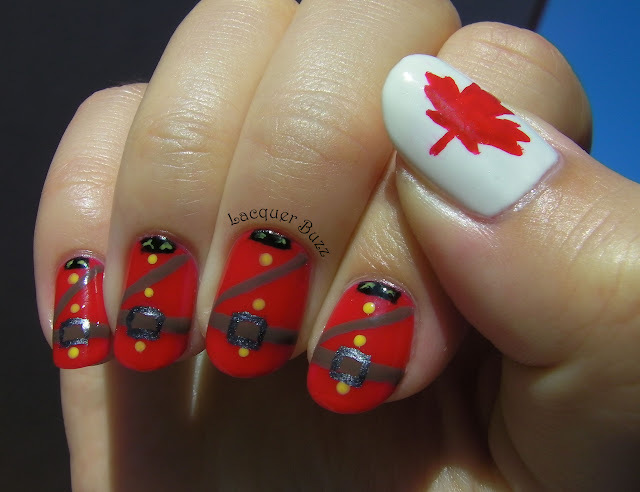 There's another nail art post coming up later. But first, let's see our blue. 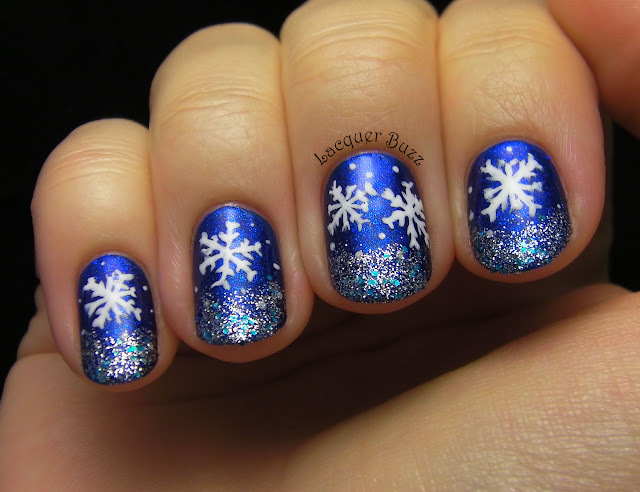 I thought I should do something festive today, so I chose a beautiful blue glitter to show you. Hope you like it! Royal Arcade is one of the Nails Inc Nail Jewellery glitters, and the name is very appropriate. There are 3 sizes of glitter in this polish, making it look like you have gorgeous jewels on your nails. The sticker on the cap says sapphire, but I would say the color of the glitter is lighter than sapphire blue. Either way, it is unbelievably gorgeous and sparkly. 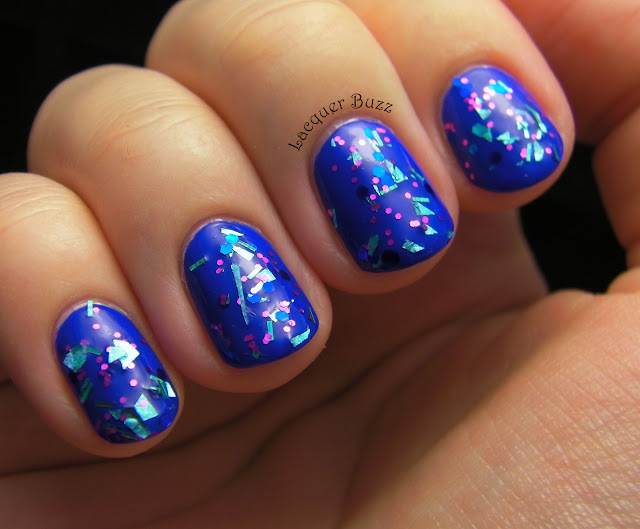 This glitter can be used both as a layering polish, as well as in a full manicure. I layered it over black to make it stand out more and to help with opacity. It would probably be opaque in about 3 coats. I did 2 over one coat of China Glaze Liquid Leather for most of these pictures. Below you have a picture of just one coat over the same black. 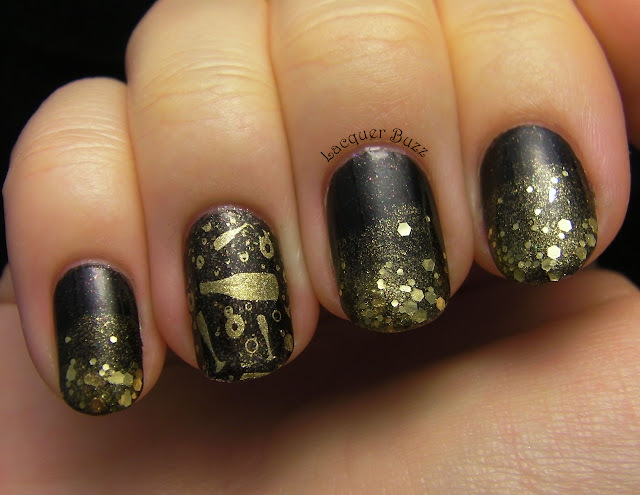 Application is a bit tricky because the glitter doesn't spread out evenly on the nail. You can see that some nails have less glitter than others. 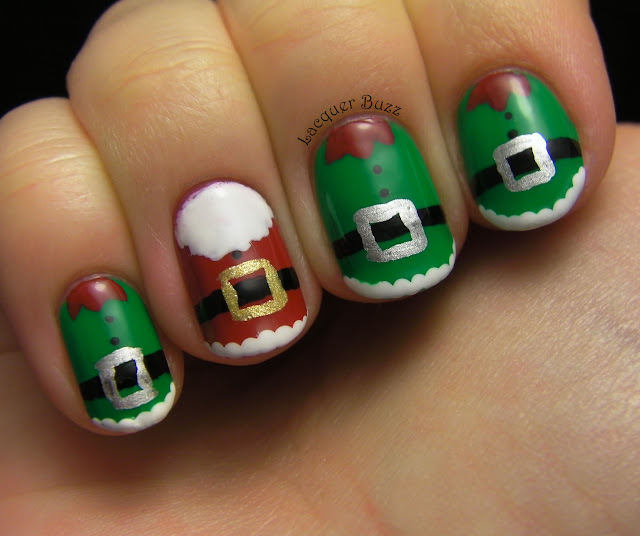 The edges of the nails are especially hard to polish properly because the glitter just runs away along with the brush. I would say that it needs to be moved around with the brush, so if you want to make it opaque by itself, a more patient and careful application is needed. It does dry very shiny, so all my pictures are without any top coat. It probably needs a couple of coats though if you wanna make it smooth. Hello my lovelies! Just a quick second post today to show you another Flormar beauty. Even though this is not a holiday polish, I think it works well with the season because it's so sparkly, and it also works for those who don't like wearing crazy colors on their nails. It is still quite bright and beautiful though. U16 is one of those polishes where the duochrome is actually stronger in photos than in real life. 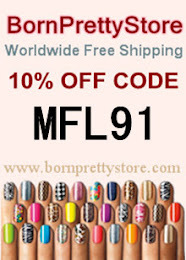 I have only found that with some of the Flormar Miracle Colors polishes. That definitely works in my advantage because I can take great photos and amaze you with these beauties. But they are seriously pretty in real life too! The polish has a glass fleck finish and the color shifts from magenta to light purple. The purple was more evident in my pictures. In real life, it looks more magenta, so the above picture can give you an idea of how it looks most of the time. The little flecks are very very sparkly. 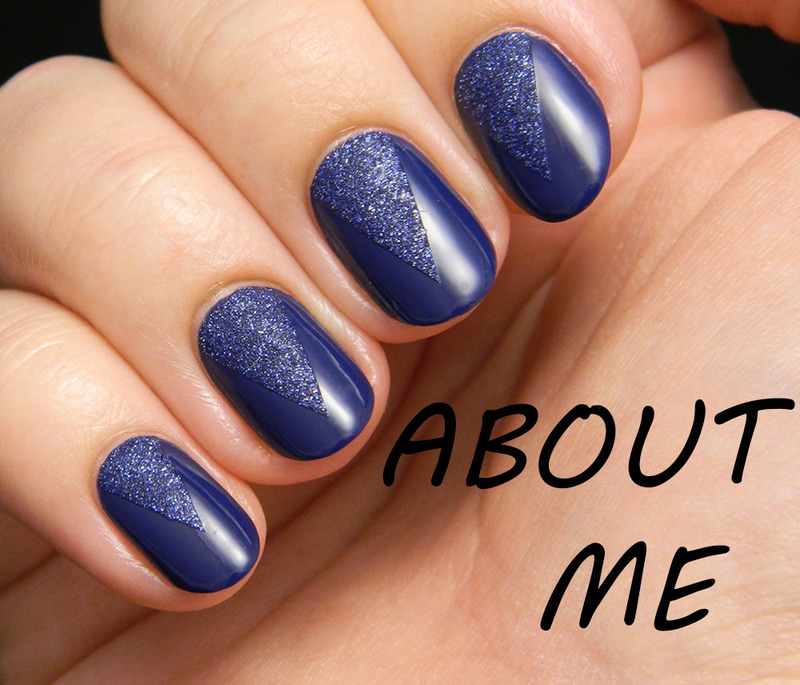 It can look like you have glitter on your nails, but without the hassle of removing it. See those tiny flecks? Really magical! The polish is a bit sheer, so I did 3 coats and there was still a tiny bit of visible nail line. Nothing too evident though. It goes on smooth and dries fast, so the 3 coats don't feel like a big effort. I also added some Seche Vite on top to make it dry faster and look extra glossy. Even though this is not a color I would normally wear on my nails, I really enjoyed it. The color shift and the sparkle of this polish make it a must to everyone who has access to Flormar polishes. Plus with the low price it has, you can never go wrong. Another winner from this brand! Hello lovelies and happy Sunday! After a few weeks of absence, Polyvore Collage Day is finally back. And since Christmas is around the corner, this week we had to do a collage with our wishlists. Fun, right? Here's mine! The 2 palettes I've included are already ordered, but none of them has arrived yet. They are: NYX The Crimson Amulet Collection (inspired by the movie Dark Shadows) on the left and Stila Snow Angel Color Palette on the right. I still have hope for the Stila one to show up tomorrow, but otherwise I will get them both after Christmas. Then I have included the China Glaze Cirque du Soleil collection. I have a huge wishlist from this collection, but I still haven't ordered them yet, so this is more of an after holiday wish. Cozy sweaters are what winter is all about, so I need a few more to stay warm this season. And then books. I love reading and I love receiving books. So basically, if it's something beauty related or books you are giving me, chances are I will be very happy. Please stop by the other ladies and see what they have on their wishlists! Happy Holidays! Hello lovely readers! This post is something out of the ordinary, but I do hope you'll like it. I got tagged by Elissa from Lissa's Polish Addiction (head over to her blog because she has beautiful manis) to do the Holly Jolly Holiday Tag. I'm always interested to know how people spend the holidays and what traditions every country has. So I thought it would be fun to answer these questions and keep the tag going, so other people do it too. Let's get to the questions! 1. Do you start your Christmas shopping on Black Friday or wait until the last minute? We didn't have Black Friday over here until this year. Now the Romanian shops are all trying to copy the American habit of having a Black Friday. I still think it's too early to do Christmas shopping on that day and I tend to do stuff pretty last minute anyway. I'm gonna pick How The Grinch Stole Christmas because I love the little town and its inhabitants. This is a hard one. I think Christmas Day because you get to relax more. Christmas Eve is usually a busy day in our household and the preparations take almost the whole day, so it's mostly work. Our country doesn't have the habit of putting up the Christmas tree early in December. So it depends, but we usually do it just a few days before Christmas. This year we've been extra lazy, so it's still not up even though it's the 22nd. Me and my sister decorate it. We'll probably do it tomorrow if we have time. I love surprises so I mostly resist the temptation. 7. Would you rather live in a gingerbread house or in Santa's Workshop? Well, as I mentioned before, the day consists mostly of preparations. My mom cooks and we clean around the house or decorate the tree if it's not up yet. Then in the evening, Santa comes and brings all the presents. We sing some carols and then open our presents. In Romania, people usually open their presents on Christmas Eve so that's what we do. Then there's dinner and watching Christmas movies or TV. It's sort of a long decoration with round parts and a hole in the bottom. And it's gold. Great description, isn't it? Nope. We don't have that over here. Yes, we used to do it often when we were little. Then in high school there was the tradition of going caroling to each other's homes on Christmas night. I haven't done that in ages though. 13. Do you countdown to Christmas? If so, how many days are left? I don't usually do that. But today is easy. There are 3 days left! 14. What are some foods and treats you can count on having every holiday season? In our country, there is a special cake that gets made on Christmas and Easter. I just googled it and apparently it's translated as sweet bread in English. It's filled with either walnut or poppy seeds or raisins. The walnut one is my favorite! 15. How has Christmas kept its magic for you as you've grown older? I guess winter and snow is part of the Christmas magic. I wouldn't feel it was Christmas if I would live somewhere where it's warm. I also love the colors, the music and the movies. It's my favorite holiday and the one time of year when I'm actually not a Grinch. This was really fun to write! I hope you liked reading it. If you made it this far, consider yourself tagged! I really want to find out how other people spend Christmas. And please leave me a comment if you do this tag, so I don't miss it! Hello my lovelies! The first day of vacation went great for me. I'm already done with the nail art for Monday and it came out great, so I'm sure you're gonna like it. But today I'm excited because I finally get to review a holiday polish that I've had for a few weeks. I love doing nail art, especially holiday themed, but reviewing polish is something I love and haven't had much time for lately. So let's see what we're looking at today. Winter Holly is my only pick from this year's holiday collection from China Glaze. Don't get me wrong, I love this brand and I love their polishes. I just have a lot of similar polishes to the ones that came out this year. Of course Blue Bells Ring is on my wishlist, but we'll see about that one. 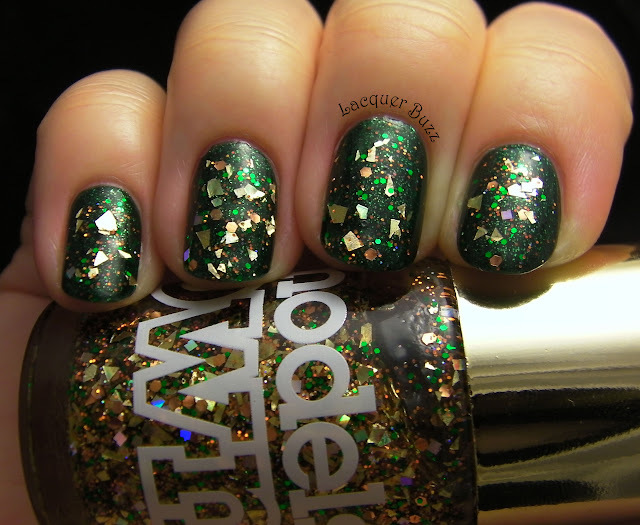 I do love a good green for Christmas, and if it's a glitter, then I can't resist it. Plus I didn't have anything similar in my collection, so this was a must. I received this a few weeks ago and I immediately had to put it on. It's just that beautiful! 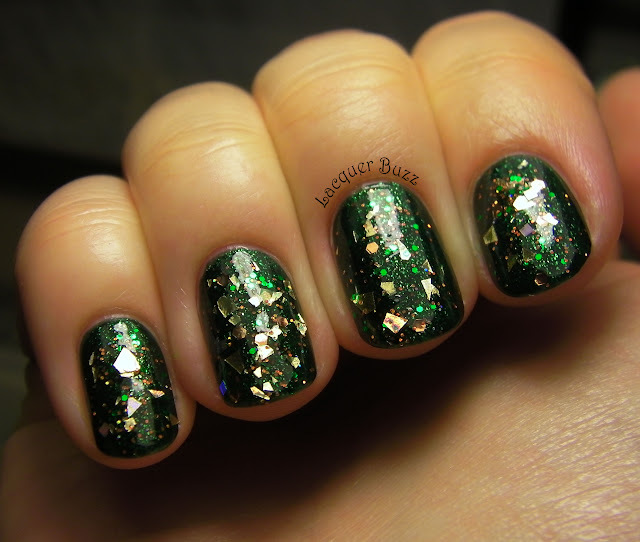 The polish consists of tiny green glitter, mixed with what appears to be gold glitter. Some of the little bits are holographic, which make the end result extra sparkly and pretty. The glitter is very dense, which makes it opaque in about 3 coats, in spite of the small size. It's easy to apply and spreads nicely on the nail. It dries to a matte finish, so top coat is a must to make it look glossy. 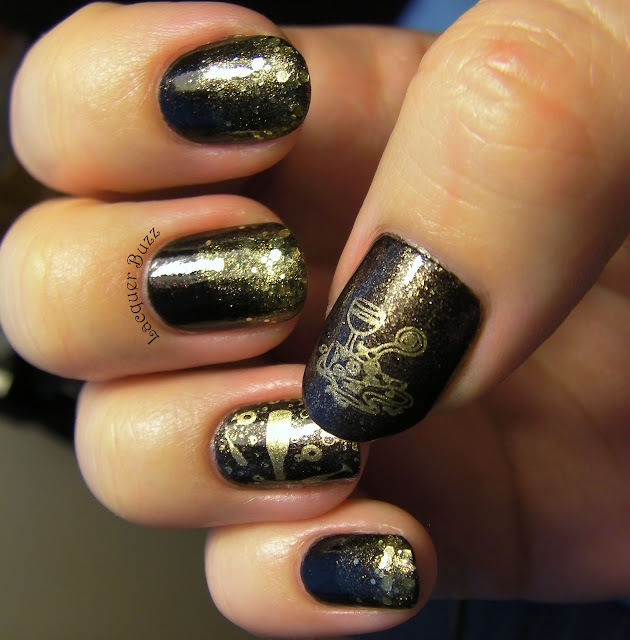 I did 3 coats with Seche Vite on top for these pictures. 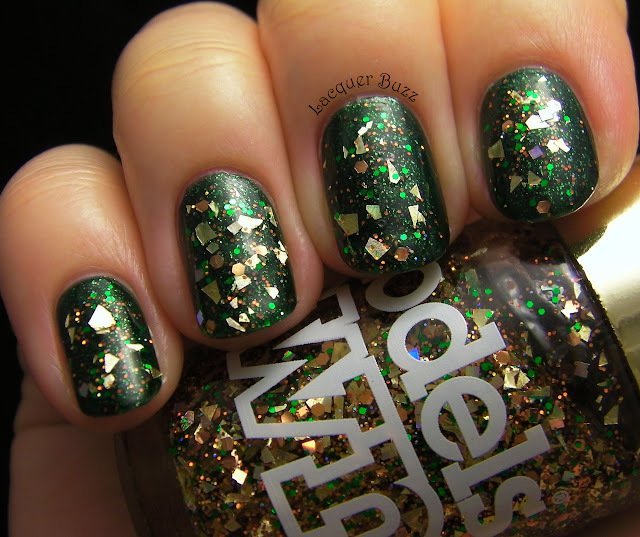 This is a great glitter, not only for the holidays, but for every season. As usual, China Glaze outdid themselves with the amazing formula on this one. I would say this is a green version of I'm Not Lion from the On Safari collection. These are great to have in one's collection because they can be worn both by themselves, as well as layered over different polishes. P.S. How do you like the new look of the blog? I decided to make it a bit wintery. What do you think?